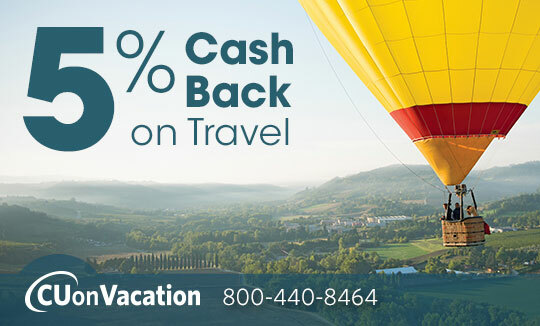 Home» Events & News » Receive 5% Cash Back on Travel! For years, CUonVacation is has strived to give you first-class service and fantastic travel deals. Now, we have yet another reason for you to take that dream vacation you’ve been planning for years. When you book with CUonVacation, you are eligible to receive 5% Cash Back on Travel*, just for being a Glendale Area Schools Credit Union member. It’s as easy as 1, 2, 3! Not only do we pay you back for traveling with us, we also provide our 100% Lowest Price Guarantee! If you find a lower price available within 48 hours of booking your travel with us, simply call us and we will send you a check for the difference! Click here to find more information on receiving 5% Cash Back and our 100% Lowest Price Guarantee. Back is based on net travel costs, excluding taxes, fees, gratuities, meals, room service, telephone calls, alcoholic beverages and other incidental expenses. Click here for details.